Viola Irene Graham Langley, daughter of Herschel Franklin Graham and Elsie Allien Collins, married to Clifton Lee Langley and buried in Cedar Gap Cemetery, Tuscola, Taylor County, Texas. Viola Irene Langley, 71, died Friday, May 21, 2004 at a local hospital. Services will be 2:00 p.m. Monday, May 24, 2004, at Pioneer Drive Baptist Church, with Reverend Jack Ridlehoover, officiating. Burial will be in the Cedar Gap Cemetery, under the direction of North's Funeral Home, 242 Orange Street. Visitation will be 6:00 to 7:30 p.m. Sunday at the funeral home. Mrs. Langley was reared in Cedar Gap. She was a graduate of Tuscola High School. She married Clifton L. Langley on March 3, 1951 in Abilene. 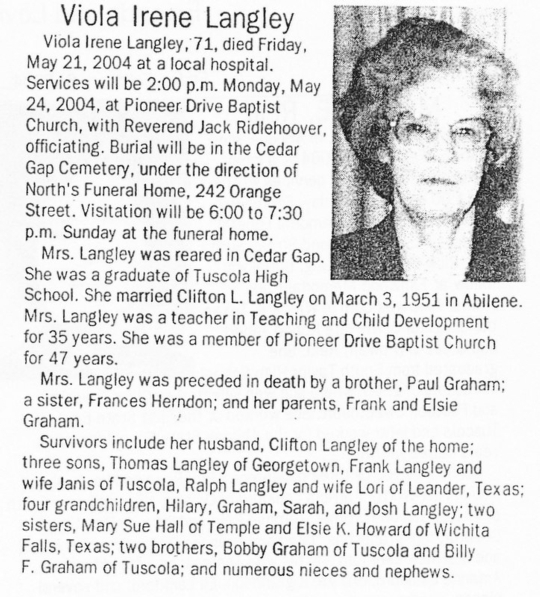 Mrs. Langley was a teacher in Teaching and Child Development for 35 years. She was a member of Pioneer Drive Baptist Church for 47 years. Mrs. Langley was preceded in death by a brother, Paul Graham; a sister, Frances Herndon; and her parents, Frank and Elsie Graham. Survivors include her husband, Clifton Langley of the home; three sons, Thomas Langley of Georgetown, Frank Langley and wife Janis of Tuscola, Ralph Langley and wife Lori of Leander, Texas; four grandchildren, Hilary, Graham, Sarah, and Josh Langley; two sisters, Mary Sue Hall of Temple and Elsie K. Howard of Wichita Falls, Texas; two brothers, Bobby Graham of Tuscola and Billy F. Graham of Tuscola; and numerous nieces and nephews.